Baked juicy chicken with a crispy crust - dream of every housewife. But how tired each time to wash the oven from fat! There is a solution: cook a whole chicken in the slow cooker. A minimum of, a minimum of dirt, but how much fun! Cooking chicken in a slow cooker will not take much time and effort, and the result will pleasantly surprise you. The finished dish tastes like grilled chicken. So, you need directly a chicken about 1.5 kg, sunflower oil, salt, garlic, favorite spices and seasonings. Here she can show imagination and to use all their culinary knowledge and skills. And maybe you already have your favorite recipe? If not, you can try just rubbing the chicken with salt and black pepper and let stand for about half an hour. In this case you get the chicken in its own juice. A traditional and popular method of preparing the carcass for roasting - spehovanie garlic. For this the slices of garlic inserted into small incisions made in various parts of the carcass: thighs, breast, wings. Also the chicken can be pre-marinated in spices and mayonnaise. It turns out delicious marinade of mustard and honey. To prepare this marinade you will need 2 tbsp. honey, 2 tbsp mustard, 1 tbsp lemon juice and 2 tbsp. of vegetable oil. Honey also acts as a natural dye, giving a pleasant Golden hue of the finished dish. The same function is performed soy sauce, but keep in mind that it does not require the addition of salt, but the lemon juice, by contrast, perfectly setting off his salty taste. As for the marinade based on vinegar, which I like to use the barbecue, in this case it is not the best choice, because the vinegar will seal muscle fiber and the chicken will turn hard. Check the chicken in the cooking process. 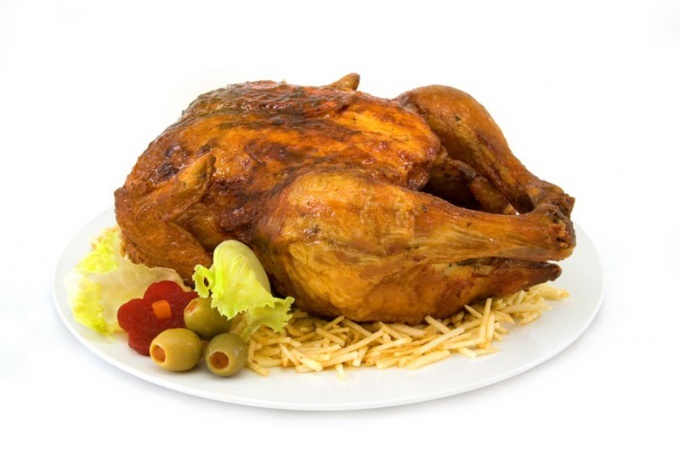 For carcasses of small size, cooking time should be reduced, while for roasting a large chicken for festive dinner, you may need about a half hour. Before cooking a dish, you need to grease the bowl Alturki vegetable oil. Oil will need quite a bit - about a teaspoon, because in the process of frying chicken let the juice out, which then can be used as a gravy or base for the sauce to the chicken. The carcass must be put in a bowl, breast down, tightly stacking the wings and legs. Shin can't tight linked thread. Select the appropriate cooking mode. For example, Panasonic and multivarok Redmond is "Baking". Most importantly, the baking temperature was not below 180-200oC. Include a slow cooker for 1 hour. After 30-40 minutes, the chicken should turn back and leave for another half hour. The chicken can be cooked in foil, but in this case, to achieve a brown crust is unlikely to succeed. In order not to damage the finish of the bowl, use a silicone mesh or Mat. The finished chicken can be served with boiled potatoes, buckwheat, rice or vegetable side dish. If desired, before baking chicken inside the carcass can be laid wedges of green apples, rice with roasted carrots and onions, or any other side dish. Then you get the dish "two in one".